A few months ago I tried to have my medical records sent from one doctor in Arizona to another. The first doctor had me fill out and sign a medical release form, worthy of a bar exam question. The doctor's pleasant, yet useless, administrative assistant took my signed medical records release and informed me that it would be at least two weeks before the records would be sent, since they outsource that task to a private company that only comes to work every two weeks. About a month later I called my new doctor to confirm that the records came and to schedule an appointment. His administrative assistant informed me that the first doctor sent a copy of my medical release form and nothing else. No records, no explanation, nothing, just the release I had signed a month earlier. This is probably the best argument out there to ban handguns and/or assault weapons. 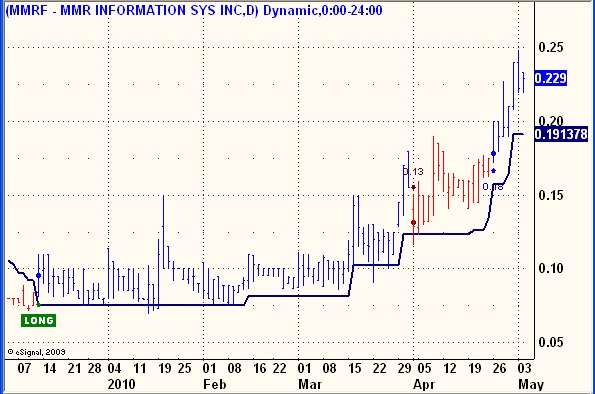 MMR Information Systems - MMRF. MMR Information Systems, Inc. provides a suite of online personal health records (PHRs) and electronic safe deposit box storage solutions for consumers, healthcare professionals, employers, insurance companies, unions and professional organizations, and affinity groups in the United States. Its solutions enable individuals and families to access their medical records and other documents, such as birth certificates, passports, insurance policies, and wills using the Internet. The company principally offers MyMedicalRecords PHR system, which transmits and stores documents, images, and voicemail messages in the system using various methods, such as fax, voice, and file upload. It also offers MyESafeDepositBox that provides online storage for financial, legal, and insurance documents, as well as medical records; and MyMedicalRecords Pro, an integrated solution, which enable physician practices to scan, digitize, store, manage, retrieve, and share records with patients through the company managed ‘software as service’ Web application. The company has a strategic alliance with Chartis to provide electronic personal health records to clients worldwide. MMR Information Systems was founded in 2005 and is headquartered in Los Angeles, California. Rather then try to reinvent the wheel with a fundamental analysis of MMRF, here is a link to a comprehensive compilation of facts and figures: MMRF estimated revenues. Management is a big feature with MMRF, it's CEO is Robert Lorsch, a mover and shaker who has a long and successful career in bringing innovative concepts to fruition and putting his shareholders on the road to prosperity. is a Los Angeles entrepreneur and philanthropist. He is Chairman and CEO of The RHL Group, Inc. http://www.rhlgroup.com, a business management and investment-holding corporation with interests in a number of companies. For over 20 years, Mr. Lorsch headed the Lorsch Creative Network, which blended marketing, advertising and interactive sales promotions using enhanced voice services for "blue chip" clients that included the ABC, CBS and NBC television networks, Campbell Soup Company, Procter & Gamble, Taco Bell, McDonalds and others. In 1994, he founded a pre-paid calling card company, SmarTalk TeleServices, Inc. SmarTalk went public in 1996 with a valuation of $57MM, and had a market cap of nearly $1 billion when Mr. Lorsch resigned as CEO in January 1998. Turning $57M into $1B in two years is a pretty impressive achievement. With MMRF's market cap currently at $46M, a similar run to $1B would take the current share price of $0.23 to over $4.00. That doesn't mean it will happen, only that it happened with his former company and could happen to this one. The more I read about MMRF, the more it appears that they are in the right place at the right time with electronic medical records. Is it worth $10/month for me to have been able to provide my own records to my new doctor, rather then participate in the song and dance routine of a brazenly incompetent administrative staff at my old doctor? 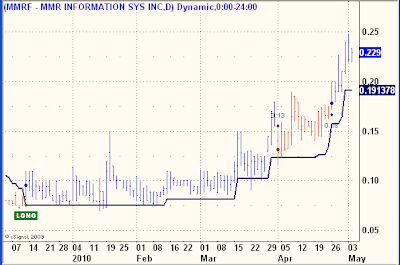 So there it is, Wave 3 of 3 down market notwithstanding, another speculative paradigm changing technology company. 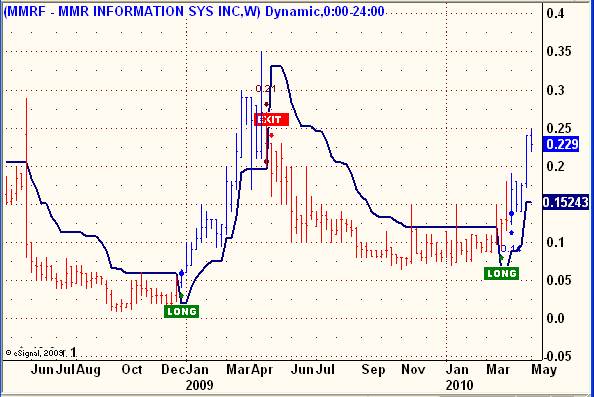 If that $0.23 share price is destined for $4 or higher, the trend models will catch most, if not all of the move. The fundamental story is there, including a management track record of having done it once already. Many years ago I ran across the book Illusions by Richard Bach. It’s takes the reader through a journey that teaches the power to manifest results. If you haven’t done so do yourself a favor and read it. The book is filled with teachings that can change your life. It did mine. One of those teachings is the theme of this blog. “You are never given a wish without also being given the power to make it true. You may have to work for it, however”. .....And working for it we will do. In the May issue of PharmaVoice there is an article on the meaning of EMR’s to Pharma and Clinical Research Organizations. The story talks about how an EMR can reduce drug trial costs and decrease time to market. What’s really happening is that the voice of the patient now becomes part of the equation. The patient will use a PHR module to record patient feedback to a data set. MMR already offers easy to use patient tools that can talk to virtually any EMR system that might be employed in such trials. That’s why MMR emerges in the article as a cost effective solution to this opportunity. The article signals the opening of another door to the use of our products and services. I like this one, I like the concept, the business plan, the management and above all, the trend models. As the market is dropping over 200 points this morning, MMRF is up 7.87% and the Trend Models are making money in both of these trends. So far, so good. your lead-in had me laughing out loud. Good one! Your endless posts lately have me worried about your sanity. I WOULD LIKE TO ASK YOU ABOUT SOMETHING THAT HAS BOTHERED ME FOR A WHILE. IT IS OFF SUBJECT, TO THIS POST. WHAT IS THE' QUIET PERIOD' MEAN IN RELATION TO NNVC? THEY CHAT ABOUT IT ALL THE TIME ON THE NNVC BOARD @IHUB. The federal securities laws do not define the term "quiet period," which is also referred to as the "waiting period." However, historically, a quiet period extended from the time a company files a registration statement with the SEC until SEC staff declared the registration statement "effective." During that period, the federal securities laws limited what information a company and related parties can release to the public. If you don't like Allan's blog..buzz off! He can post whatever he wishes..it is his blog. I didn't buy MMRF yesterday @ .23 but ended up buying today @ .26. This may hit a dollar in no time. would I pay 120 a year for the service? No. the concept? well, it sounds like the perfect 'dual use' technology for the U S government. people need a more efficient technology for access to their medical and all other personal records....and so does the U S government,access to all its citizens records. If Google,(now a surveillance arm of the govmnt) has access to every web search you ever do,if all computers have the back door chip for govmt access, etc etc.... you see the concept easily extended with MMRF. Just as you see it with the 2010 census form we all received. If the country is becoming a surveillance security state more and more,and it is, the American way,is,has always been, to do it in a stealth way that happens without the public realizing it. Thats where the brilliant concept of "Dual Use technology " come in handy. one purpose is good ,for the public good. thats what gets advertised on television and in the media. the other purpose is nefarious and cunning. with a flick of a switch,the government (and clever hackers) will have access to all info about us. Maybe they already do anyway. Its just like the cell phone technology. When did you realize that cell phones are homing devices? how long after they came on the market? When did you realize they can function as two way listening devices?even when they are Turned OFF? 8 years after they were invented? 10 years? I only discovered this about cell phones maybe 3 years ago. Is it a good concept to foster technology that provides easy electronic access to all your personal info,online,inside your computer,available at the hack of a key stroke? But,I fully expect this stock to flourish,just as you described. Will we be investing in FEMA stock soon? companies that make barbed wire,maybe? Re: would I pay 120 a year for the service? No. Try getting a coy of your medical records from your doctor....then decide.